Unlike other wire shelving systems, our exclusive Elfa Closet Rod is one continuous length. A Closet Rod Holder snaps onto a 12" or 16" Ventilated Bracket to hold the rod securely. Choose the rod length that most closely matches the width of your hanging space. Rods can be cut to length free of charge. Contact us for details. Add Closet Rod End Caps to both ends of the Closet Rod for the finishing touch - no closet is complete without them. Use one Holder at each end of the Rod and at intervals of 36"
Use our exclusive Elfa 3' Back Stop Bar between two Uprights above a Shelf to keep smaller items from slipping off the back or to keep books and binders lined up. Similarly, our exclusive Platinum Elfa Clip Bookends help maintain order side-to-side. 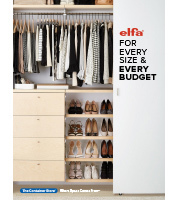 Elfa Closet Rods is rated 4.6 out of 5 by 31. Rated 5 out of 5 by spatialsolutions from A beautiful Elfa component to complete the design TCS thinks of everything. I am a Professional Organizer and sell a lot of Elfa. This closet rod can be ordered cut to a specific size. Don't forget to order the plugs for the ends which give the rod a seamless look. Rated 5 out of 5 by SLewis from I Love the whole elfa system, it's easy to set up and you can interchange the parts. Rated 1 out of 5 by gp22 from 49.1 inches!! Note that this closet rod is not actually four feet, which would be 48 inches. It is 49 1/8 inch for some reason. Be sure you measure carefully and measure each item!!! Rated 5 out of 5 by Wingcruzin from Excellent product This pole has a nice chrome finish and is very sturdy. Rated 3 out of 5 by gogreen12 from Good but.... The closet rods are strong and fit the rod brackets perfectly. BUT...they are never longer than 4 feet. So if you have a closet with walls not in 4 foot increments, you have a problem. Since the rod brackets do not allow hangers to slide past them, just putting sections together do not work smoothly. Rated 5 out of 5 by FamilyOfFour from Love my new Elfa closet system Rating the platinum closet rods - these rods (with the end caps) are fantastic rods compared to what I had previously in my closet. The hangars move easily across them. Great quality. Rated 5 out of 5 by gramatana from Great Quality These closet rods are strong and really smooth, allowing all types of hangers to glide easily. The end caps give a nice clean finish. They work well in the laundry as a "drying rod" for placemats and other such items when there isn't ample flat surface for drying. The rod is large enough in diameter to not leave a crease in the piece being dried. Rated 5 out of 5 by Hangingez from Elfa is (Pretty) easy to hang with! We are just finishing 5 closets! We had a pro hang the top racks but completed the rest...ourselves. Best tip is to install the shelves on the top first , work top down and really watch your spacing. If you are adding fascia, they can be great spacers. Measure every time as hang standards can shift. We easily cut shelves with short metal blades, be super careful! Results are more than we ever expected! We are extremely pleased with the results and love the Container Store's staff for all their assistance! Rated 5 out of 5 by LMD1 from Excellent! These are the best rods, they don't dent or scratch and never need cleaning to sparkle in your closet and make your hangers look clean and professional! Rated 5 out of 5 by angkatbolt from Smooth gliding. My hangers never get stuck. This was a great solution in my closet! Rated 5 out of 5 by cdarlingone from Love these rods I bought this hanger rods and found them very useful. Rated 5 out of 5 by tj2012 from love my closet, but.... i recently did my walk-in closet in platinum elfa. i love it. the components were extremely easy to install and are extremely durable. the only issue i had with the elfa components was with the 2 ft closet rods. they are shown on the website as 2 ft rods without any additional measurements. i needed one a bit smaller so i ordered a custom cut rod at 23 inches. it was too short. the 2 ft closet rods are actually 25 inches. the container store is a great company, but they should put exact measurements on their items. they did send me a replacement 2 ft rod, custom cut to 24 inches. Rated 5 out of 5 by jopritch from Hangers Slide Easily Hangers slide easily across this closet rod. Looks sleek, too. Rated 5 out of 5 by MollyGracePhotography from I love Elfa! We use Elfa shelving in our home office closet. I am a photographer and use the closet rod to hold the tissue paper we use for packaging. It keeps the paper from getting wrinkled and makes it easy to grab a sheet or two. Elfa shelving is great. I'd love to put it in every room of my house. Rated 4 out of 5 by amuhlou82 from Not just for closets This item, along with rod holder brackets were a finishing touch to my recent kitchen upgrade. I used the bar as a paper towel holder , custom cut to the same specifications as our ventilated shelves. It has been fun creating a custom solution that fits our space needs perfectly. Rated 5 out of 5 by SusyQ from Nice quality Great rod compared to many other brands. Very strong, yet can be cut with a metal hack saw. Does not appear scratched after a year of use. Rated 5 out of 5 by AuntieMaim from Finishing Touch While the extremely cost-conscious might find these unnecessary, they do give the visible ends of the elfa closet rods a nicely finished look. They're made well and they fit nicely into the closet rods too. Rated 4 out of 5 by jlmm from best for laundry room! bought whole elfa customized system for my laundry room- ilove the additional hanging room & storage it gave me! Rated 5 out of 5 by Alexandra from Closet Rods These are fine; the end caps, not so much, because one is loose in the closet rod, which means that either the end cap was too small or the rod was too big. Quite annoying as the other cap went in with a satisfying snugness. . Rated 5 out of 5 by MadtownMom from Sturdy, sylish rod that works perfectly with the elfa closet systems. Hangers slide easily on it. Rated 3 out of 5 by handyguy from recommend with reservations This is the only item that can be used as a closet rod for elfa so by default you have to recommend it for that, but beware of the following gotchas..... I put in 36" shelves and ordered 36" rods. Rods are actually 37" to fit the holders properly when you're installing only ONE 36" section. For a run of two or more sections, the end rods need to be cut down by 3/4" and the middle sections by 1-1/2" for everything to fit properly. This isn't taken into account by their onsite design software. If you're ordering online you are unable to specify partial inch measurements. I had to make return trips with specific instructions to trim. Also note (this is minor) that the labels on these rods leave the most residue of any. Have plenty of goo gone on hand. Rated 5 out of 5 by stemathis from LOVE IT!!! The closet rods are great looking and you can customize the size also! Rated 4 out of 5 by CleaningTherapy from Versatile Great quality, versatility, and sturdy. The store will cut to any requested length. Rated 5 out of 5 by KarenP from Looks great and is strong too I wish I did not wait as long as I did to upgrade the closets two down and two more to go. Container Store here I come. Rated 4 out of 5 by freedml from good but tricky great to be able to put a rod under any shelf. The new holders need the rod 1" longer than before to look right. Rated 5 out of 5 by Knit from Closet Rods I loved the end peices, they just finished off the rod. Very easy to snap in place. Rated 5 out of 5 by holliston01746 from So Easy to Install I purchased an elfa system for my tiny bedroom closet. It was incredibly easy to install... that most difficult part of the job was removing the old shelves. Couldn't be happier with this purchase. Can the rod be cut down to 12&rdquo;? Not usually because the shelf size is standard? Is there a weight limit per rod? We do not have tested weight capacities for this product; when used with the elfa system, it will support the weight of your everyday wear. How long should two rods be if wire shelves are 40&quot; and 16&quot;? I am putting two wire shelves across a 59&quot; wide closet. I have two shelves in the space, one 40&quot; and one 16&quot;. How long should the rods underneath be? I want to have the option of starting with one rod under the 40&quot; shelf and then expanding to put a clothing rod across the entire closet without recutting a rod. Each hanging rod would need to be 1/2&quot; shorter than the shelf. This would ensure the rods can &quot;Join&quot; together in the closet rod holder. Essentially, the rods would share the same closet rod holder where the shelves meet together. Can we cut the rods to size ourselves? Yes, with suitable equipment, you can cut your elfa Closet Rods. Or, you can bring your previously purchased elfa Closet Rods and elfa Ventilated Wire Shelves to your nearest store with your measurements. When I order a custom cut, do I get both parts of the rod? ex: I order a 2' rod with a 12&quot; custom cut. Will I get both 12&quot; pieces? Or do I have to order it twice? FYI: I did not receive the other halves of my &quot;scrap&quot; so you will have to order each piece you need individually. Is the white rod still available? My closet shelving is white and I want to rearrange with longer versions of the white rods that I purchased two years ago. Our elfa Closet Rods are only available with a chrome finish. What is the difference between 2', 3', and 4' rods? Is that the diameter of the rod? My closet design uses 2, 3, and 4' rods. Is that okay or will it look weird? Thanks! The measurements refer to the width of the rod. Please contact our customer solutions department or LiveChat with us for further assistance. I'd like to have my local hardware store cut the one I have purchased, and would like to let them know what the rod is made out of. elfa Closet Rods are steel with a chrome finish.